The final day of the 2017-2018 Race 4 Eight season provided the final opportunity for Race 4 Eight stars to claim R48 crystal and earn ranking points. The R48, WR48, and SR48 crowned champions on Sunday, while Playoff matches would decide year-end ranking positions. Killian Carroll and Sean Lenning met for the fifth time this season and for the third time in a final, with Carroll winning three of the four R48 7 matchups. Lenning was the only player to defeat Carroll this season, rallying from a 0-9 third game deficit to stun the R48 #1 in Las Vegas. Carroll is the only player to have won two Player’s Championships in the history of the R48 and would be seeking his third in Sunday’s final, while Lenning would be seeking his second Player’s Championship. Carroll and Lenning played the game at its highest level from the start, with both superstars littering the stats sheet with bottom-board kills and ace serves. Carroll appeared to take control, taking a 12-8 first-game lead. 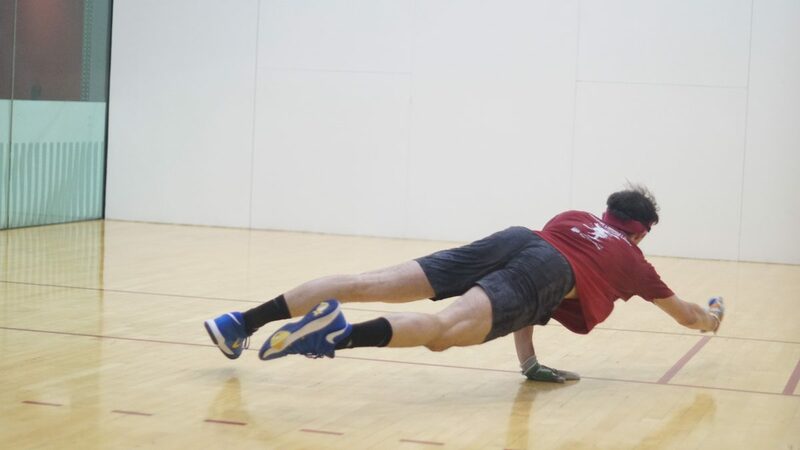 Lenning earned a side out and scored the next six points with a barrage of fly kills and left-handed “spoiler” kills to serve for the first game at 14-12. Lenning hit his first serve short and second serve long to hand Carroll the serve with a shocking double fault. Carroll took advantage of the opening, forcing overtime and eventually winning the game on his fifth attempt. Lenning regrouped in game two, dominating Carroll with a wide variety of two-handed offense, forcing a third game in dominant fashion. 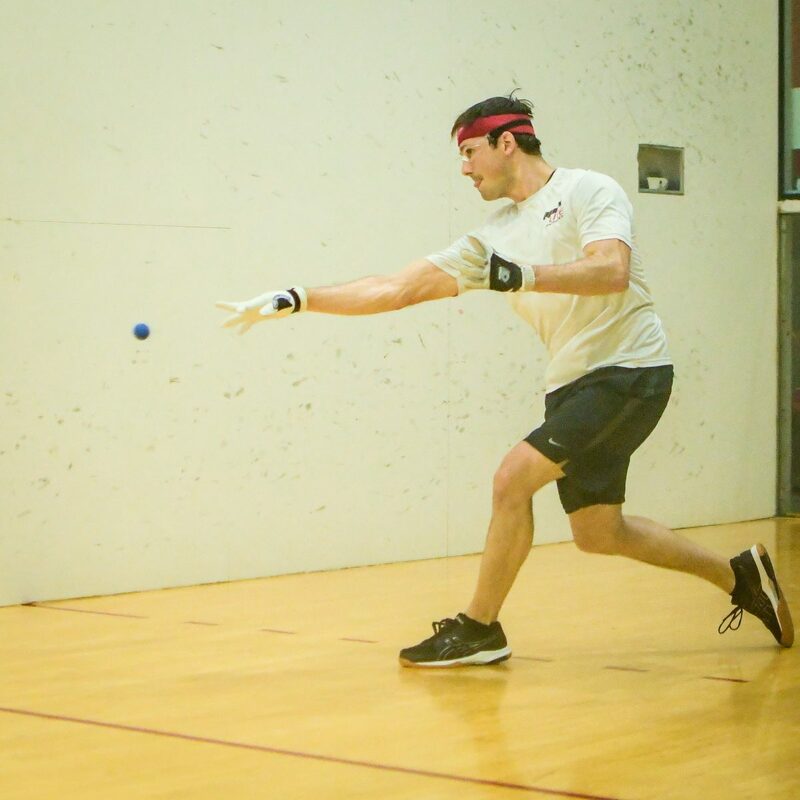 Lenning continued his charge in game three, building a 5-0 lead and seemingly on his way to his second Player’s Championship. “At that point I used a code word to reset my thought process,” Carroll would later say. After a 32-shot rally at 0-5, Carroll appeared to be reenergized, as Lenning appeared to show signs of exhaustion. Carroll caught Lenning at five and scored six more points before Lenning could stop the streak at 11. Carroll climbed to 14-7 and called a 30-second timeout to focus on what he hoped would be the final rally. “Against Sean no lead is safe, not even 14-1, so I wanted to end it right there,” stated Carroll. Carroll ended the match and the best individual season in the history of the R48 Men’s Pro with a diving re kill into the right corner, one of the best shots in the history of the tour. Carroll ended his monumental season with six wins in seven starts, making him the most prolific single-season winner in R48 Men’s Pro history. Vic Perez capped an impressive season by dominating his LAAC teammate Mando Ortiz to clinch fifth, while Diarmaid Nash set aside his disappointment from his round of 16 loss by overcoming Erik Torres in the 9th place final. Catriona Casey met Aimee Tuohey for the first time in a WR48 final, with Casey seeking her 15th WR48 title in 17 WR48 events and Tuohey seeking her first WR48 title in her first final. Casey had never lost in the Player’s Championship, having won the first four WR48 Player’s Championships dating back to 2014. Tuohey impressed the large gallery in game one, executing a number of kills and applying pressure that forced several Casey errors. Casey was more precise in game two, never allowing Tuohey to setup in the front court and running away with the match. Courtney Peixoto de Melo overcame frequent sparring partner Tracy Davis in a close one-game match for 3rd, while Suz Koehler notched her first victory against Ashley Moler for 5th. University of Texas teammates Kristen Hughes and Scarlett Smith faced off for 7th, with Hughes winning the battle of Austin. David Fink and Marcos Chavez met for the third time in a SR48 final this season, with Fink winning the first two encounters in Las Vegas and Houston. Chavez had never lost a SR48 match in Salt Lake City and was aiming to defend his SR48 Player’s Championship, while Fink was trying to win his first SR48 Player’s Championship. Fink led throughout much of the first half, but very little separated the two, as the lead was never more than three points. Fink took a 15-13 lead at the half and stretched the lead to 17-13. Chavez tied the score at 18, changing his serve and catching fire on his patented back wall kill. Fink regained control, taking a 22-18 lead with a right-handed back wall flat kill, but Chavez was not about to let his Player’s Championship defense end. Fink missed several opportunities to score the 23rd point and Chavez rallied, switching to a power serve and running out the match with seven consecutive points. Thank you to the outstanding Ace Disposal crew for another outstanding Aces event. Thank you to Matt and Lon Stalsberg, Ruben Garza, Gary Scogin, and all of the volunteers who made the Aces Player’s Championship the “Player’s Stop” for the seventh consecutive year. Thank you to the WPH staff, WPH film crew, and all of the Race 4 Eight pros for their efforts at the Aces Player’s Championship and throughout the tremendous 2017-2018 Race 4 Eight season. Saturday in Salt Lake City featured the R48 quarterfinals and semifinals, the WR48 semifinals, and the SR48 semifinals. 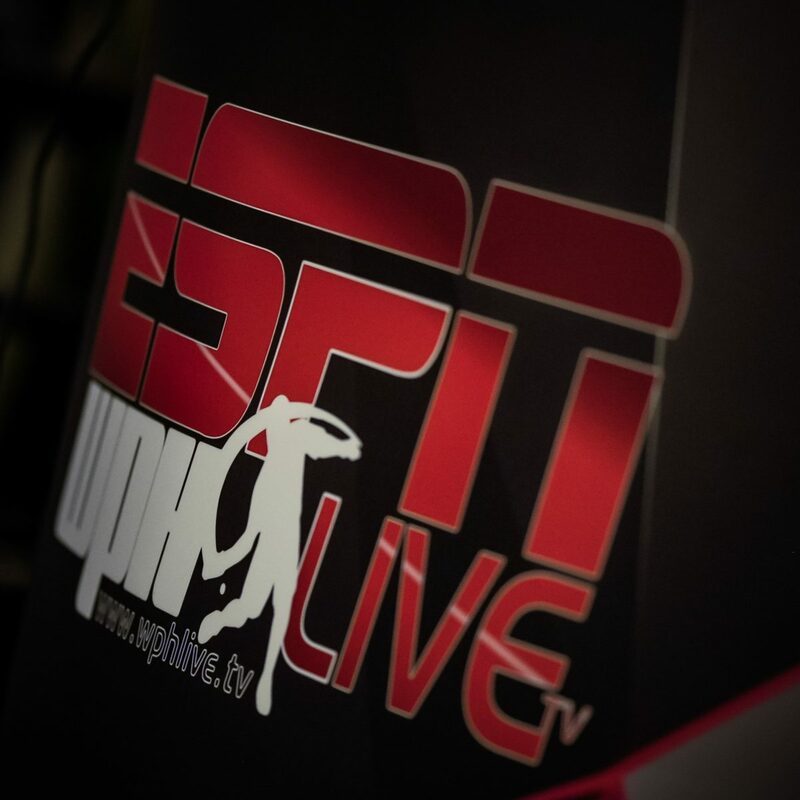 The action-packed Saturday produced sensational handball action at the Sports Mall, as hundreds of players and fans cheered on the pros court side, with thousands more watching on ESPN3. Killian Carroll entered his quarterfinal match against Vic Perez with a 2-1 head-to-head edge and seeking his seventh R48 semifinal of the season. Carroll started slowly but found his groove midway through the first game, lighting up the stats sheet with kills and winning passes to advance to the semifinals. Daniel Cordova and David Fink met for the fifth time in their R48 careers, with the two Elite 8 stars splitting their first four encounters. The two traded the lead in the early part of game one until Cordova took a 7-all tie to a 14-7 lead. Fink scored five in a row to climb back into the game but Cordova was able to close out the game, 15-12. Cordova took charge in game two, taking control with a power hop serve and incredible speed to cruise to the semifinals. Mando Ortiz had not looked like Mando Ortiz since making the final in Montana in January, but appeared to have found his game in his opening round win against Erik Torres. Luis Cordova entered the quarterfinal match with Ortiz in the midst of his best and most consistent R48 season, having advanced to seven quarterfinals and one semifinal. Lucho took a 5-0 lead in game one with just nine swings. Ortiz would rally, launching his offensive attack from everywhere on the court to pull within striking distance at 12-11. Lucho maintained his composure, scoring three of the final four points of the game to take a one-game lead. “There wasn’t much that separated us in the first game, Mando made a few errors and that was the difference,” stated Lucho. 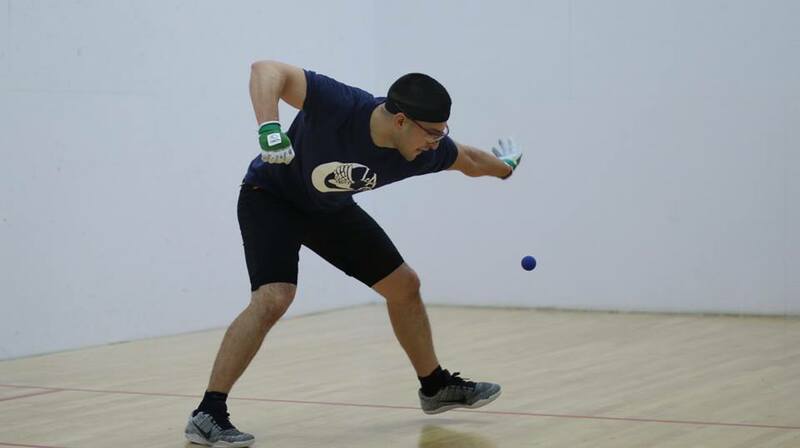 Lucho took a 9-3 lead in game two before Mando caught fire again, tying the game at 10 with highlight reel kills. Lucho withstood the Ortiz onslaught, taking a 14-12 lead and serving for the match. Ortiz tied the game at 14, forcing overtime. Both players served three times at 14-all, with Lucho finally scoring the final two points of the game to take the match. “I was definitely thinking about the match in 2015 when I had Mando 14-9 in the second game and he came back to win,” stated Lucho. Sean Lenning owned a 4-1 head-to-head advantage against his junior and pro rival Emmett Peixoto, but Peixoto had been playing some of the best ball on tour in the past two months, advancing to consecutive semifinals in the last two R48 stops. Lenning never allowed Peixoto into the match, blasting serves that appeared to take off as they hit the floor and ending rallies with just one or two swings. “I don’t think I’ve ever seen someone serve the ball that hard,” stated Killian Carroll. Lenning led 7-0 and closed out the first game 15-6 and was even more dominant in game two, holding The Rock to just one point. “I’m always inspired to play Emmett and I was really enjoying being on the court today,” stated Lenning. 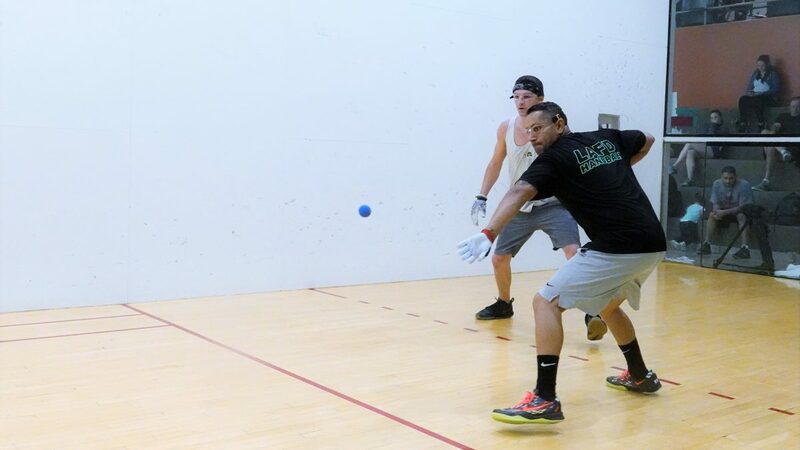 Sean Lenning and Luis Cordova met in the bottom bracket semifinal, with Cordova aiming to repeat his finals appearance from last season and Lenning trying to repeat his Player’s Championship victory in Salt Lake City in 2015. 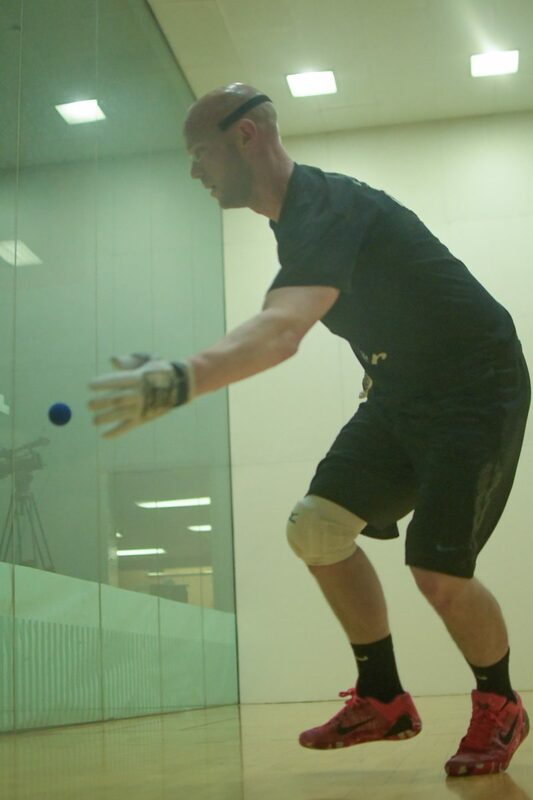 Lenning picked up where he left off against Peixoto in game one against Cordova, using his serve to dominate. Cordova slowed the game down in game two, capitalizing on quickly fatiguing Lenning to work his way into the match. Cordova evened the match, setting up a race to 15 for a spot in the final. Clearly missing the zip on his serve and kills, Lenning dug deep into the well for energy and scoring opportunities. Cordova was also fatigued but continued to battle as well. The pair were tied at eight and 10, with the knowledgeable and appreciative Salt Lake galleries on the edge of their seats and awestruck at the heart and skills of two of the world’s best. “This is all about will and I love it,” stated WPH donor George Blocker from the gallery. Lenning hit two ace serves to take a 12-10 lead and found himself serving at 14-12 for the match. Lenning closed the show with an ace down the right to book his ticket to his third R48 final of the season. 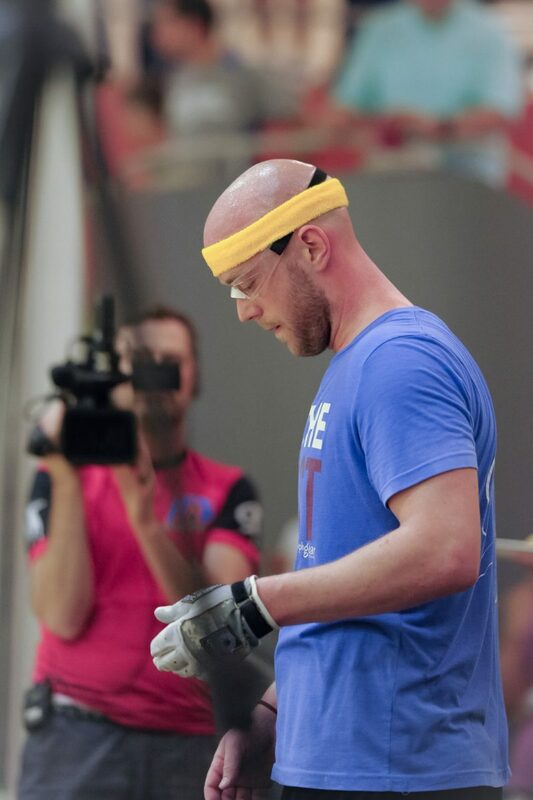 “I set my goal to reach every semifinal this season and I came close,” stated Lenning. 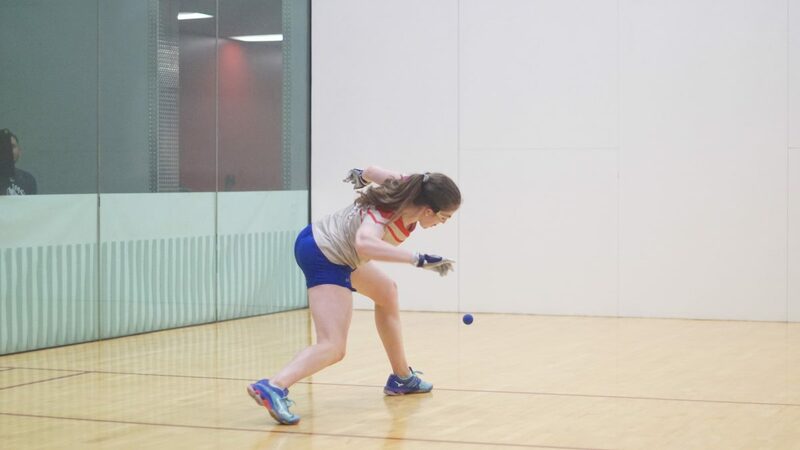 WR48 #1 Catriona Casey continued her run of WR48 dominance in the quarterfinals, ousting Aimee Fadden in two lopsided games, while Salt Lake City’s WR48 #2 seed Aimee Tuohey had little difficulty advancing to the semifinals against the University of Texas star Kristen Hughes. Tracy Davis and Dr. Ashley Moler renewed their exciting rivalry that has spanned a decade in the second upper bracket semifinal. 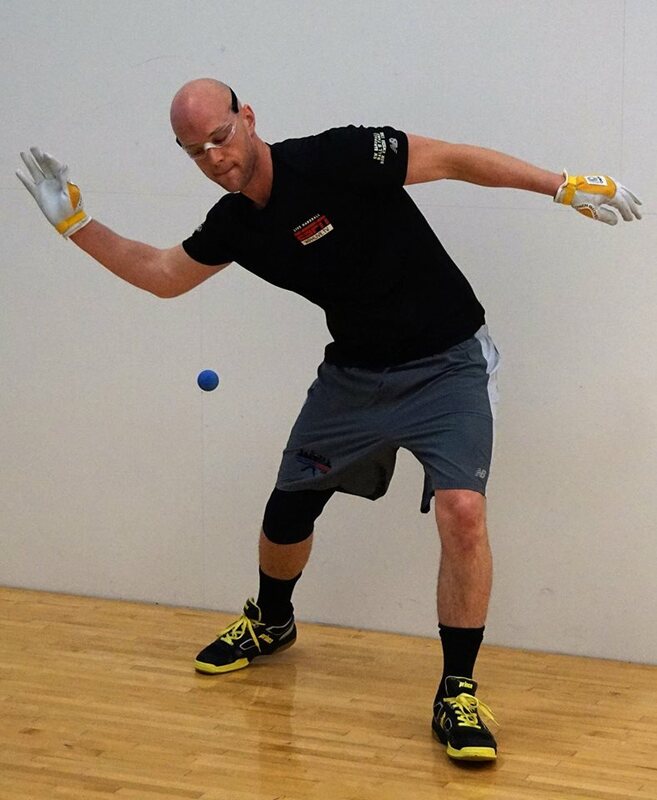 Trey Dey was in control throughout against Dr. Moler, never allowing the Tucson fist-shot artist into the match and winning in a two-game sweep. WR48 Las Vegas ’18 finalist Courtney Peixoto de Melo met WR48 NYAC ’18 finalist Suz Koehler for the first time in a blockbuster matchup in the second bottom bracket quarterfinal. CPM was too strong for Koehler, outscoring the Missouri dynamo 30-6 in a one-sided route. “Courtney played nothing like she did in New York and was shooting the ball with both hands,” stated Emmett Peixoto. 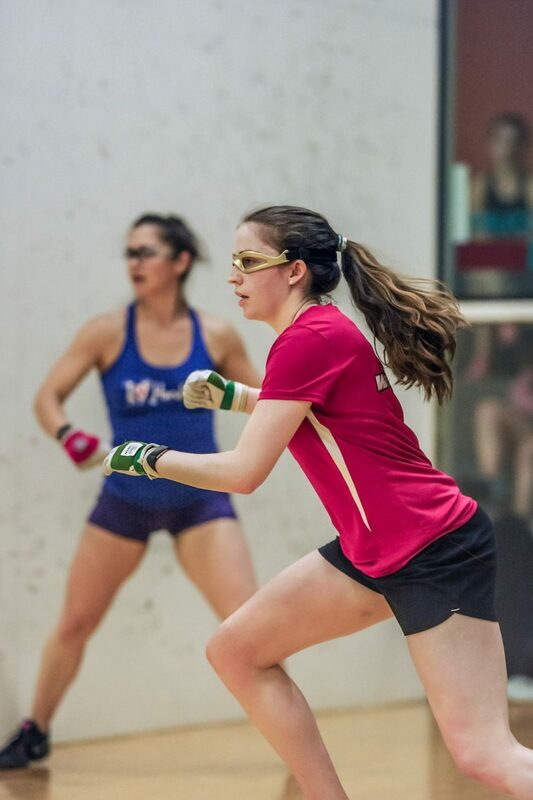 Catriona Casey played flawlessly against a determined Tracy Davis, who was playing at her highest level of the season. “Tracy had a great serve going and she really made me pay for any mistake,” stated Casey. 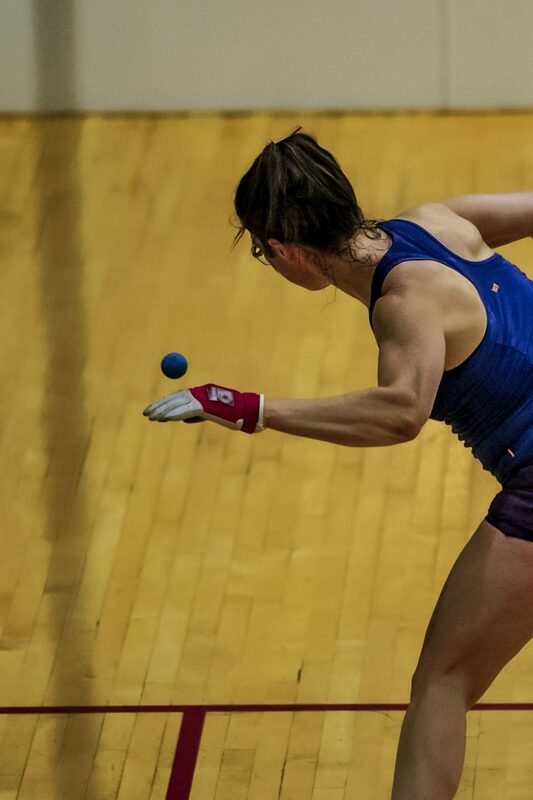 Casey made only one error in the two game match, advancing to her 17th WR48 final in 17 WR48 events. Aimee Tuohey and Courtney Peixoto de Melo split their two matches this season, with CPM winning in Las Vegas and Tuohey winning in New York. Tuohey was completely dominant in the rubber match, keeping CPM in the back court and shooting the ball with both hands when CPM gave openings. “There not much I can say, I mean Aimee just played great,” stated CPM. 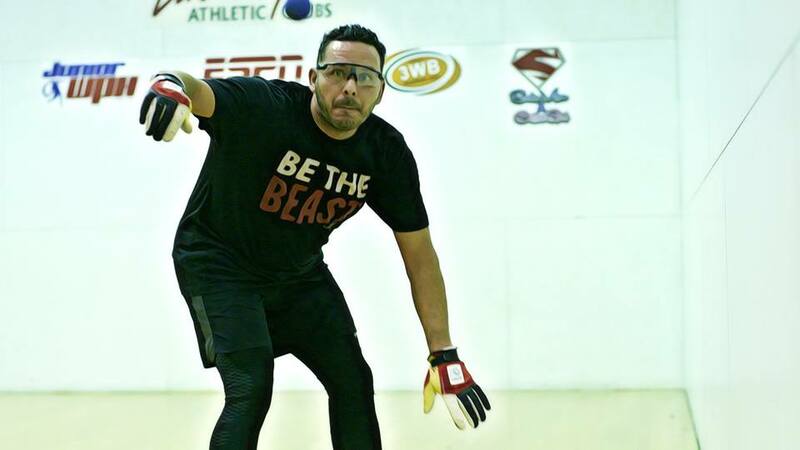 Defending SR48 Player’s Champion Marcos Chavez faced Dr. Dan Zimet in the semifinals for the third consecutive SR48 event, with the mid 40-something stars demonstrating that the mid-40’s are the new early 30’s. Chavez played with a ruthlessness against the 47-year old Dr., driving serves down the right wall, making acrobatic re kills, and seizing virtually all of his offensive opportunities. 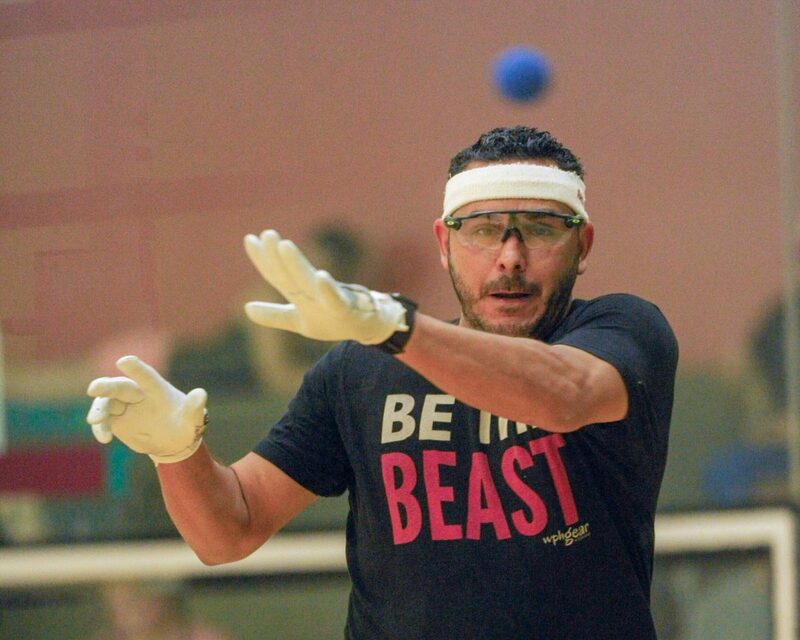 “I just couldn’t put enough pressure on Marcos with my serve returns, and when I served, I couldn’t put him under any pressure,” stated Dr. Z. Chavez advanced to his third SR48 final of the season and continued his quest to defend his SR48 Player’s Championship. 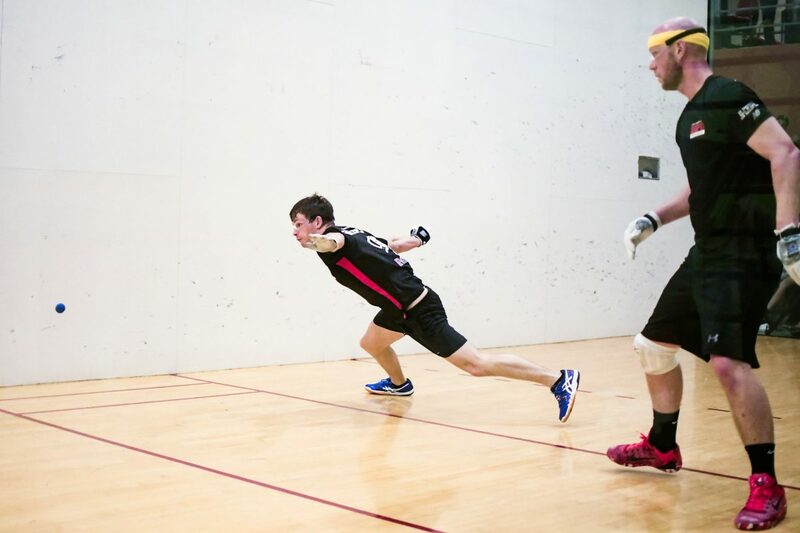 All of the R48, WR48, and SR48 were in action on Friday at the ’18 R48 Salt Lake City Aces Player’s Championship, with each of the Race 4 Eight stars aiming for the most coveted prize in professional handball: The Player’s Championship. Play kicked off on Friday morning with the Race 4 Eight qualifier, featuring eight R48 stars in the top 25 and WR48 #1 Catriona Casey. The R48 main draw kicked off on Friday afternoon, with the eight qualifiers joining the R48 Elite for a spot in the quarterfinals. The WR48 and SR48 also kicked off on Friday, playing down to the semifinals. Friday’s qualifier featured the most lopsided qualifier finals of the season, as the top seven seeds cruised in lopsided matches. 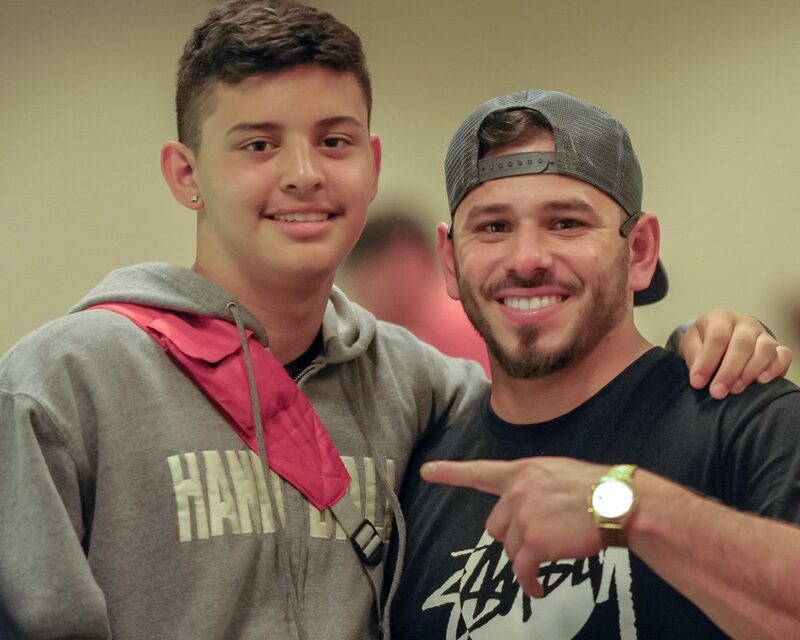 Shorty Ruiz became the first player to qualify in every event in a R48 season with his qualifier win against Pete Svennungsen. 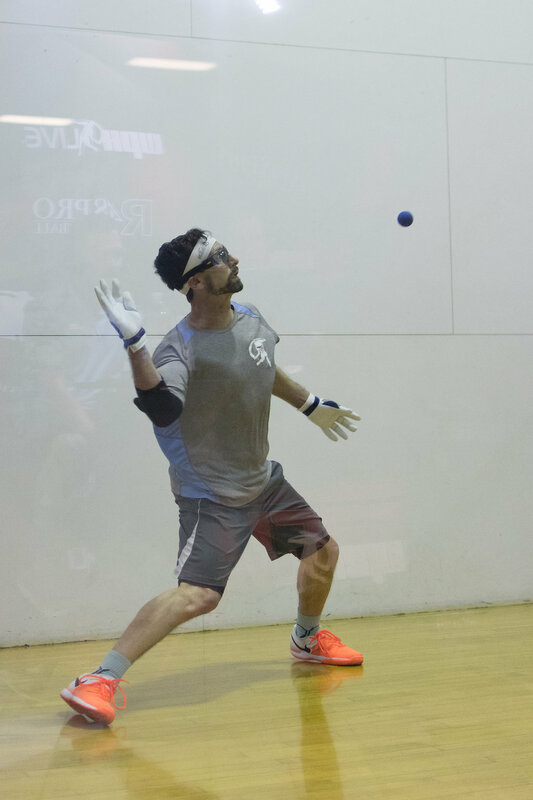 George Garcia, Jr. authored the lone upset in the qualifier final, qualifying for the first time in his R48 career by ousting the current Oregon State and Pacific Northwest Regional champion Dalton Beall. R48 #1 Killian Carroll had little difficulty with first-time R48 qualifier George Garcia, Jr. in his opening round, overwhelming the SR48 star in two quick games. 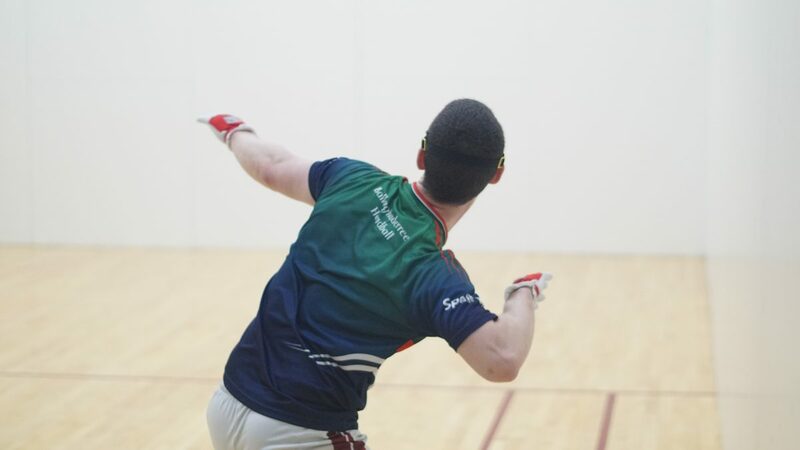 R48 #2 Sean Lenning cruised in his opening round against the Olympic Club’s Loren Collado, while Mando Ortiz overcame a second game charge from the Olympic Club’s Erik Torres to advance to Saturday’s quarterfinals. Tucsonans David Fink and Abraham Montijo met for a spot in Saturday’s quarterfinals and Tucson bragging rights. Fink started quickly, building a 10-0 first-game lead and was never seriously threatened en route to a two-game sweep. R48 #6 Luis Cordova and Jonathan Iglesias met for the second consecutive event, with Lucho winning an exciting three-game battle at the NYAC three weeks ago. Lucho would not need a tiebreaker this time, as he eliminated the Colorado star in two games. SR48 #1 David Fink defeated Tom Stone to advance to his third consecutive SR48 semifinal, while defending SR48 Player’s Champion and SR48 #2 Marcos Chavez was pushed by St. Louis’ Michael Benkelman. 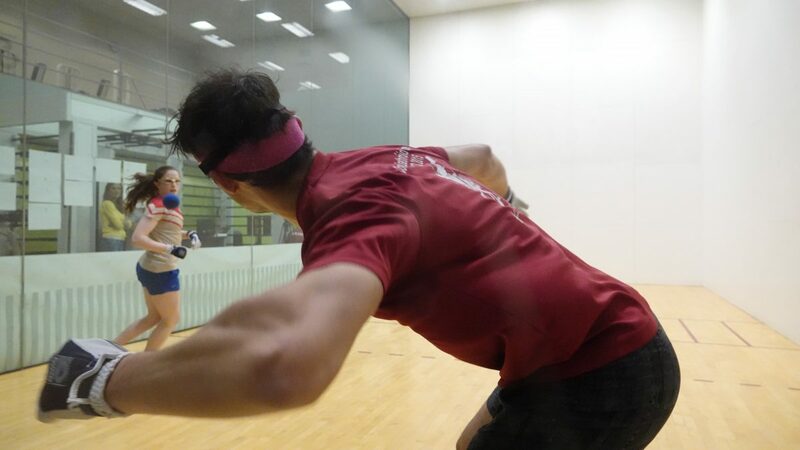 George Garcia continued to play great ball after his qualifier win, defeating Jim Karner to advance to the semifinals. Dr. Dan Zimet advanced to his third SR48 semifinal of the season, playing high quality ball against Colorado’s Kevin Price. “I thought I was playing tomorrow so my cross-country flight landed just two hours before my match,” stated Dr. Z. I started cramping midway through the match but fortunately had built a big lead. 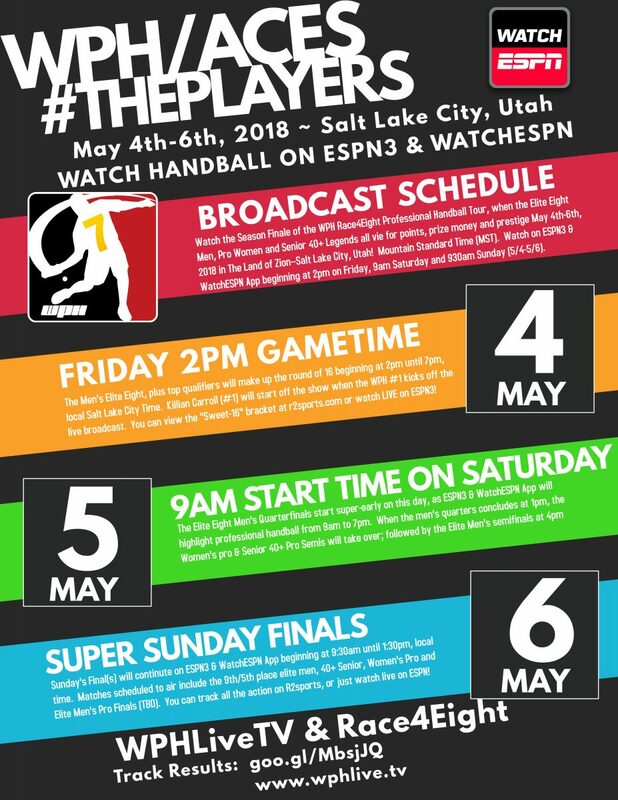 The 2018 WPH R48 Salt Lake City Aces Player’s Championship provides professional handball’s greatest showcase, featuring the R48, WR48, and SR48 battling for the Player’s Championship, the most coveted prize in professional handball. Check out all of the important Salt Lake City Aces tournament information and links for the entire Race 4 Eight 7 tour below.